WEsay A fashionable Italian resort with great food and good skiing. Perfect for intermediates, similar to Chamonix but less crowded. Book skiing holidays in Courmayeur at Chaletline and take advantage of our fabulous rates on ski hotels in the resort. Courmayeur lies at the foot of Mont Blanc, Europe's highest mountain, close to the French border in the Aosta Valley. It is a characteristic Italian village of cobbled streets, stylish shops and excellent cafes and bistros, all set within an attractive medieval centre. For those wishing to know more about the resort there is a rather charming museum paying homage to the area's heroes. The main skiing area is at Plan Checrouit and, with over 80% of the skiable terrain covered by snow cannons, snow here is virtually guaranteed. From here slopes fan out in all directions and are especially good for improving intermediates. 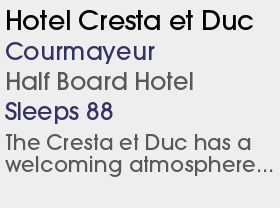 Powderhounds should instead head for the trees or the three classica runs from Cresta d'Arp - the Arp Vielle to Val Veny, the deserted valley to Dolonne or Pre St Didier and the Youla gorge to La Thuile. Or alternatively get the cable car from La Palud all the way up to Punta Helbronner to access the famous Vallee Blanche run on the Chamonix side. 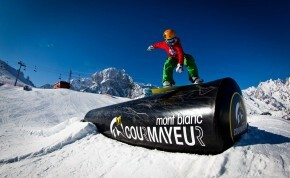 Parklife in Courmayeur is still in its infancy but offers a boardercrooss run with plans for further development. Back in the resort there is a sports centre and plenty of shopping opportunities. The nightlife is good, with the usual selection of bars and pubs as well as a few nice restaurants. The Dzeleuna double chair connecting the Checrouit side to the Val Veny side will be taken over a triple, expanding the carrying capacity by two-thirds. The fourth Mountain Gourmet Ski Experience organised by Momentum Ski and Heston Blumenthal will be held from 17 to 20 March 2017. The new two-stage, 80-person Skyway Monte Bianco cable car from near Entreves to Punta Helbronner at 3460m on Mont Blanc opened. The cabins rotate 360 degrees during the journey to make the most of the stunning views. It starts lower than the old cable car and has a new underground car park.